At JAN-PRO Edmonton, we’re here to make sure your facility gets the commercial cleaning services it needs. We offer a 100% guarantee of our work, meaning that if any issue should ever arise for whatever reason, we will work to resolve it within 24 hours. You want to make sure that your cleaning services are professional, consistent, on time and done right. JAN-PRO owner operators are invested in your facility and are trained to provide you exceptional office cleaning services. At JAN-PRO in Edmonton, we offer complete office cleaning and commercial cleaning services for a wide range of clients, from small local businesses to large companies with numerous locations. No matter what your size, we have a solution for you. Our commitment to the highest quality clean and dedication to excellent customer service is what makes JAN-PRO Edmonton the top choice for janitorial services in the area. We understand that our customers are so busy growing their own businesses that the cleanliness of their office, warehouse or retail store is not always top-of-mind. At JAN-PRO, we’re committed to taking the stress of having a clean and healthy facility off of your hands. With a customized JAN-PRO office cleaning schedule tailored to meet your needs, you can rest assured that your property in the Edmonton area is being cleaned thoroughly, and in an eco-friendly manner every time. JAN-PRO is the only commercial cleaning company to offer EnviroShield® to its clients. Patented by JAN-PRO, EnviroShield® is a disinfection program that totally eliminates harmful bacteria, viruses and fungal spores, such as H1N1, H5N1 and Influenza types A, B and C.
JAN-PRO Edmonton is more than just commercial cleaning! We offer our clients a wide range of specialty services that aren’t just eco-friendly, but are effective, too. Bruce is very excited to expand JAN-PRO’s services into the Edmonton market. The success of the JAN-PRO program has resulted in numerous Calgary and Red Deer customers to request that we service their Edmonton locations as well. The ability to partner with a true gentleman like Al made the decision to expand into Edmonton very easy. One thing that won’t change with our expansion into Edmonton – our commitment to be the best commercial cleaning company in the province. This means providing a great business opportunity for our Franchisees by teaching them a program that delivers exceptional customer service to the businesses we serve. Al spent 16 years in the hotel industry. Within his job, he travelled extensively to various corners of the world and gained valuable skills working with people from different cultures. 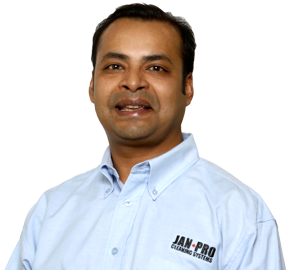 Al joined the JAN-PRO family in 2011 as a Unit Franchisee where he and his wife served nine businesses in the Calgary region. Al then worked as a Quality Assurance Manager at the JAN-PRO Calgary office before deciding to spearhead a Northern Alberta location. 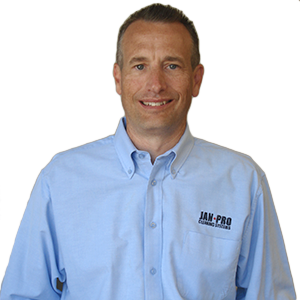 Al’s experience managing customer needs and his expertise delivering superior service to his clients are valuable assets to JAN-PRO as our business continues to expand throughout Canada. Al enjoys helping novice entrepreneurs train and develop their business as Unit Franchisee within the JAN-PRO system.